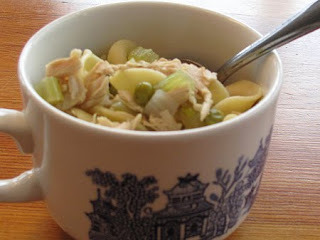 The Un-Official Blog of Romance Author Maddie James: It's a soup day: Turkey Noodle! And when it's cold outside there is nothin' better than soup. Wait. I'll one-up that. There is nothing better than having all the ingredients for soup in your pantry so you can make homemade soup. I hate wasting food, even leftovers, and usually find ways to use up all those bits of this and pieces of that. That's what I did this morning when I made Turkey Noodle Soup. So, here is what I found in my pantry and here is how I made my soup! Chop celery and onion. Saute in bottom of large stock pot in 1/2 stick of melted butter and a round or two of olive oil in the pan. Saute until onions turn translucent. Add chicken stock and water. Bring to a boil and turn down to simmer. Add turkey and let sit at a high simmer for about 5 minutes. Add egg noodles and spices, salt and pepper to taste. Bring back to a high simmer until noodles are tender. Add drained can of peas near the end of cooking. A quick soup that came from stuff all ready to go in my pantry. Love it! Now, if only I didn't have to go outside to pick up a prescription I forgot to pick up last night. But, oh well, I know what's waiting for me when I get back! Yummers. After that, I'm putting the finishing touches on my latest project, Family Stories, Family Recipes cookbook. Guess I better get moving!